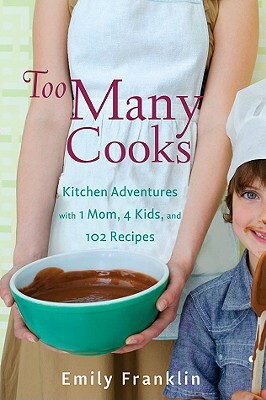 Hilarious and wise, Too Many Cooks celebrates a year in the family kitchen with one mom, four kids, and a picky pediatrician husband. Franklin seasons her stories with how-I-did-it advice on cooking and parenting that makes this such a delightful and inspiring read. And with more than 100 simple, mouthwatering dishes, Too Many Cooks is a happy mix of recipes, memories, and good storytelling. EMILY FRANKLIN is the author of "Liner Notes" and "The Girls' Almanac." She is also the author of several Young Adult novels. Her fiction, poetry, and articles have been published in "The Boston Globe" and the "Mississippi Review" among others, and been anthologized in Some Kind of Wonderful: Contemporary Writers on the Films of John Hughes and "When I Was a Loser: True Stories of (Barely) Surviving High School by Today's Top Writers"and the forthcoming"WHAT I WOULD TELL HER: 30 Top Women Writers on the Mother--Daughter Relationship. "Franklin studied at Oxford University, received her BA from Sarah Lawrence College, and her MA in Writing and Media Studies from Dartmouth College. Prior to being on the staff of National Public Radio's "Car Talk" show, she was a chef on historic and luxury yachts. Several of her recipes from that time were published in the cookbook "Tea Time Journeys." She lives near Boston with her husband where she is a full time mother to four children ages eight and younger with no childcare.